Traquair House is reputed to be the oldest inhabited and most romantic House in Scotland. Why see Traquair House and Garden? It is surrounded by woodland which borders onto the River Tweed. See old fashioned roses and herbaceous borders within a partially walled garden during the summer. There is also a large maze which is great for kids and grown ups. The gardens are not extensive but are worth a visit if in the area combined with a visit to the House. Further improvements are being made. 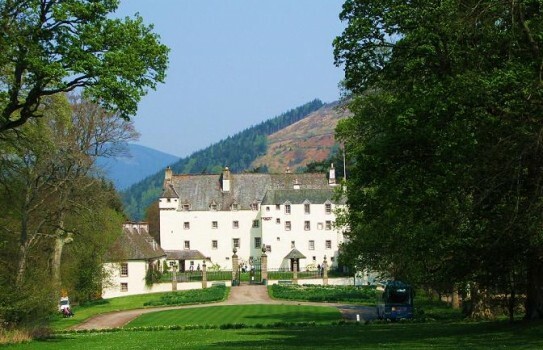 See the comprehensive Traquair House web site for further details. Traquair House Garden 2019 open 1 April. Information on website. Gift Shop, Restaurant, Partial disabled access ring for details. If you want to take a break near Traquair House, Peebles, why not stay in one of our recommended hotels. Each hotel has genuine guest reviews enabling you to book from anywhere in the world in total confidence. Look now - click here.